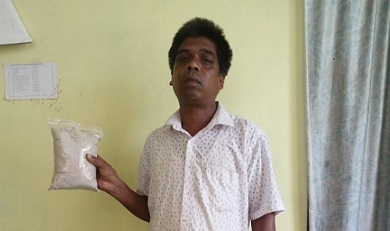 In a major breakthrough, the joint forces of Pengaree-Bordumsa police in Tinsukia district, arrested one Jeram Purti, 38, son of Late Mikhel Purti of No 2 Kujupather area under Bordumsa Police Station and recovered from his possession 1 kg of brown sugar on Wednesday evening. The Pengaree and Bordumsa police personnel have been carrying on a relentless drive against drug abuse as a lot of youths have been caught in the vicious vortex of substance abuse in the district. tip-off, we put up a check post near Pengaree police station and and arrested the peddler from a Bordumsa-bound passenger bus and he was found to be in possession of the brown sugar”. A case has been registered at Pengaree police station against Jeram u/s 22 (b) of the Narcotic Drugs and Psychotropic Substances (NDPS) Act, 1985. Meanwhile, SP Tinsukia, Mughdajyoti Mahanta, while lauding the efforts of the Pengaree and Bordumsa police, informed that a huge network of drug peddlers are operating along the Assam-Arunachal Pradesh border in the Bordumsa and Pengaree areas. He further stated that the police is keeping a hawk eye on these peddlers and the drug barons and are trying their best to take the youths of Tinsukia district out of the vicious cycle of substance abuse.